Fill your next year with colorful memories with your own personalized wall calendar with your own photos. 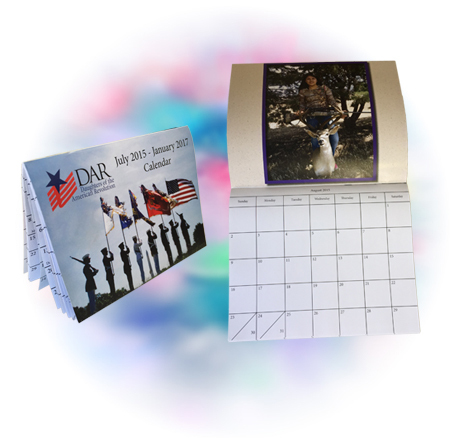 Or, add some character to your desk at home, school or work with a completely customized personal photo desk top calendar. These are spiral bound in table top tent style to sit neatly and easily visible on your desk. Magnetic calendars give you another perfect marketing tool to keep you and your company in the eyes of your customers. Have a special memory of a vacation spot, sporting event or any other fond occasion that you wish to keep in mind throughout the next year ­ maybe a wedding or anniversary? Then we also offer poster size calendars in an array of sizes as well. Visit our section on Posters for more details. We can provide full color digitally printed magnets. From small business card size to large poster size. All types of styles are available – from calendars, promotional to personalizedd.